Newlyweds Chelsea and Jamie Adams have shared their home for about two years with their poodle, Rosemary. The house is no fixer-upper; in fact, its flooring and counters received updates just before the couple bought it. However, Chelsea and Jamie always had one project in mind. “No matter where you walk in the house, you gotta walk through the kitchen,” Chelsea says. “We know we want to improve the way it looks, the way it feels when you walk in, but we don’t have great ideas — or at least I don’t,” Jamie says. They know they want a kitchen cabinet makeover; that means resurfacing the cabinets and replacing the cabinet doors. However, the couple’s biggest complaint is that they have no pantry, so canned goods are stored wherever they can find a spot – that includes the laundry room. But those aren’t their only problems. 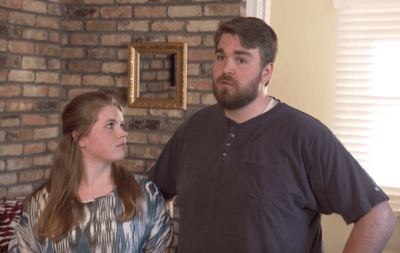 “Today’s Homeowner” host Danny Lipford noticed the microwave hangs just 13 inches above the range; such tight space prevents Jamie and Chelsea from stirring a pot of gumbo while cooking. Fortunately, those days will soon be over because Danny has an idea to make this space more manageable. “Today’s Homeowner” host Danny Lipford and homeowner Chelsea Adams remove kitchen cabinets. 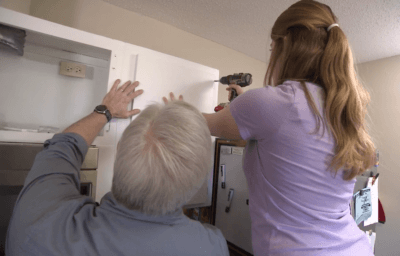 Jamie and Chelsea’s kitchen makeover begins with removing the cabinet doors; the team will reface the cabinets and replace the cabinet doors with new ones. The cabinets are sanded down during prep work; Danny then fills in any voids with auto body filler, often found under the trade name Bondo. After sanding, the team cleans off the dust and wipes all surfaces with a liquid deglosser. The deglosser allows the contact adhesive to adhere to the cabinets and the veneer. Next, they apply contact cement to the back of the veneer that will cover the cabinets. Contact cement allows an almost two-hour window before you must apply the veneer. Each piece of veneer is carefully pressed into place; going over it with a roller removes air bubbles. Overlapping edges or trim pieces can be cut with a utility knife or a router with a flush trim bit. 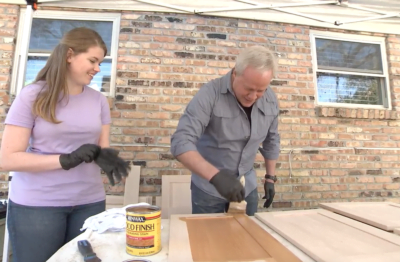 Chelsea Adams watches while “Today’s Homeowner” host Danny Lipford stains her new cabinet doors. Jamie and Chelsea’s new cabinet doors need just one coat of stain, Danny says. That’s why it’s important to apply the stain evenly. First, stir the can of stain; do not shake it. We used Minwax Wood Finish. Next, apply the stain. We passed the brush steadily, up and down, on the wood. Finally, lightly drag a cloth over the wood after you’ve finished to ensure the stain adheres evenly. We then added crown molding above the cabinets for a finished look. An electrician runs wiring behind Jamie and Chelsea’s wall for the outlet that will be located behind the new pantry cabinet. The outlet will power the microwave so the couple no longer must choose between having a microwave or stirring their gumbo. 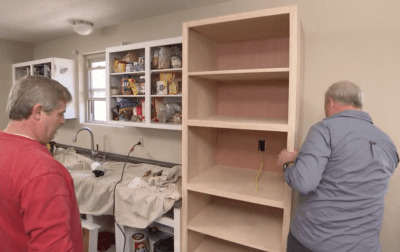 “Today’s Homeowner” host Danny Lipford secures the new pantry cabinet to the other cabinets. Next, we secure the pantry to the other cabinets and the wall and use a mill file to smooth out the surface without fraying the veneer. Finally, we apply a coat of polyurethane. Now that Jamie and Chelsea have a separate pantry cabinet, which stores the microwave, they can use a new range hood for ventilation. We installed the NuTone Osmos range hood; it has just three sones. A sone is a unit of measurement for sounds’ perceived loudness, so this one will allow Chelsea to hear the TV while she cooks. 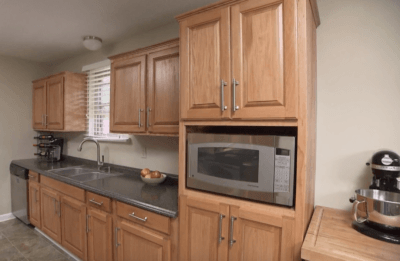 Here’s Jamie and Chelsea Adams’ kitchen after our makeover. So, what do the Adamses think about all the changes? Having a trash can in the kitchen can be convenient, but it also can be smelly. Here’s what you can do about that. Watch the video. Wet/dry vacuums can clean all kinds of messes, but most of them also have some shortcomings. Most, that is, except for Rigid’s Wet Dry Vac. Watch the video. Should You DIY or Hire It Done?